The Refugee Food Festival is an international event in support of refugee chefs, helping them connect with the local restaurant industry and integrate themselves into the city. 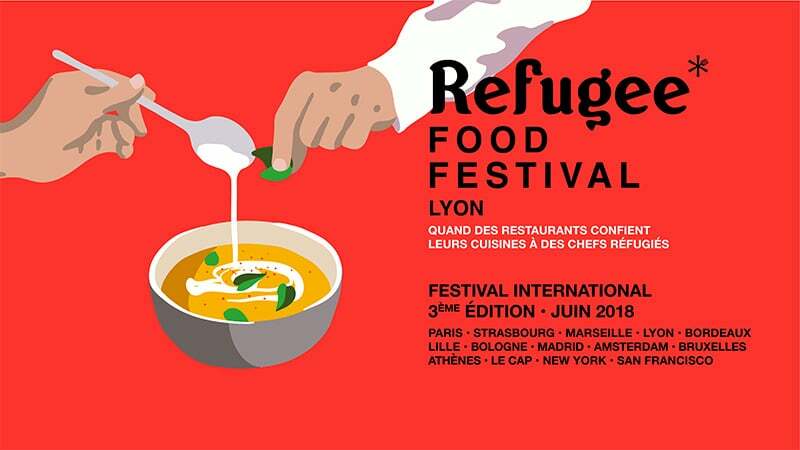 Lyon is among the 14 cities on the program for the 2018 international Refugee Food Festival. Taking place internationally from June 12-30, the event comes to Lyon from June 13-17. An initiative from the UN Refugee Agency (UNHCR) and the association Food Sweet Food, the Refugee Food Festival invites refugee chefs to take over local kitchens for an evening and create their own menu from the culinary culture they left behind. First started in Paris in 2016, the Refugee Food Festival has grown into an international event, with the third edition encompassing 14 cities in 8 different countries around the world. Alongside Lyon are Paris, Madrid, Brussels, and New York among others. Capitalizing on food as a universal feature in all cultures and countries, the festival seeks to debunk stereotypes and change the way refugees are viewed in society. It allows refugee chefs to show their talent and facilitate their integration, helping them find jobs after the festival ends. The festival includes chefs from Afghanistan, Somalia, Sudan, Iraq, Syria, Rwanda, Ukraine, and many other countries, mobilizing citizens, non-profits, and local authorities to make changes in how refugees are treated. In Lyon, the festival runs from June 13-17. June 13 is opening night with a vegetarian and vegan dinner. June 14-16 includes lunch and dinner each day, while June 17 ends the festival with a special closing night. The meals feature Syrian, Malaysian, Afghan, and Bengali cuisine and will take place at Les Mauvaises Herbes (Lyon 1), La Table d’Althusser (Lyon 3), Café Arsène (Lyon 1 and 2), Ravigote (Lyon 3), Le Ballon (Lyon 2) and Johnny’s Kitchen (Lyon 5). Reservations are required for everything except the closing night. More information can be found on the Facebook page.